But in the hands of Crowe, the rock journalist-turned-director, it becomes a rather glutinous mix of teen-romance tropes, unearned emotion, clichéd dialogue and underdeveloped characterizations, liberally sprinkled with Crowe's trademark classic-rock songs. Crowe seems vastly more interested in the two-legged animals – Benjamin, fetching zookeeperKelly (Scarlett Johannson), Benjamin's children, the sullen teenager Dylan (Colin Ford) and adorable 7-year-old Rosie (Maggie Elizabeth Jones), and Lily (Elle Fanning), an improbably smiley 13-year-old with a crush on Dylan – than on the majestic lions, tigers, bears and other fauna residing at the zoo. Though the animals get ample screen time, it seems Crowe's heart is really with the humans' contrived and often cringe-making romantic yearnings. Benjamin's situation is similar to that of George Clooney's character in THE DESCENDANTS – grieving his dead wife and struggling to raise his two children alone. The older kid, Dylan, is coping badly and has been expelled from school for crimes that include drawing ghastly pictures of decapitations (the kind of drawings that are actually standard fare among adolescent artists these days). Benjamin takes possession of the house and the zoo, which comes with a built-in “wacky” crew, including a guy with a capuchin monkey perpetually perched on his shoulder. Benjamin, who lacks any experience with wild animals, relies on the pretty, dedicated Kelly, who lives with her mother and has no life apart from the animals. 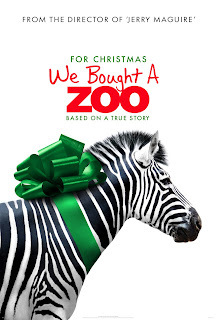 He must contend with the zoo's heavy financial burdens, the threat of a comically villainous zoo inspector (John Michael Higgins), the difficult decision of whether to euthanize an aged, ailing tiger, and a desultory attraction to Kelly. At the same time, adolescent zoo apprentice Lily tries to cozy up to the recalcitrant Dylan, who ignores her. After his dad gives him some advice about “courage,” Dylan suddenly explodes in a paroxysm of love for Lily, a development suggested less by the foregoing action than by Crowe's JERRY MAGUIRE and SAY ANYTHING. (He does not, however, serenade her by holding up a giant boombox blaring “In Your Eyes”). The film has the advantage of a very good cast and the elements of an entertaining and emotionally rich story. But the screenplay, by Crowe and Aline Brosh McKenna (who also committed the unpardonable MORNING GLORY and THE DEVIL WEARS PRADA), falters. Crowe's technique leans heavily on his cherished music – a score by Icelandic musician Jonsi and songs by Neil Young, Bob Dylan , Cat Stevens and other stalwarts – to compensate for a lack of genuine, earned emotion. The nervous embarrassment produced by some scenes reminded me of how I felt when reading Conversations With Wilder, Crowe's book about his directing idol, Billy Wilder (with whose talents he shares nothing in common). In the book, Crowe invited the esteemed writer-director, then approaching 90 years old, to recount how he lost his virginity. Two out of four stars.